Dates for the next teacher training course are under review and will be released in due course. The 200 hour yoga teacher training course will be run over eleven weekends in London and at a five day residential out of London. Knights Hall, 23a Knights Hill, West Norwood, LONDON SE27 0HS. The course is accredited by IYN (Independent Yoga Network), and students may obtain personal indemnity cover with their certification. 5% discount for full course payments made before the start of the course. Bursaries available subject to circumstances. Payment plan to be arranged in advance of course. Principles of Modification; disabled, elderly, children, pregnancy. Daily experience of teaching small groups, building confidence and establishing personal methodology. Accredited certification on completion of first aid course (at your own expense, before or after the course). This course intends to offer a basic foundation for the teaching of Classical and Hatha Yoga, without being specifically tied to any school or style. Minimum 200 hours of study. Guaranteed personal liability insurance with Yoga Link enabling graduates to teach in health clubs and yoga centres nationwide. This part of the course is an opportunity for the trainees to immerse themselves in the yogic lifestyle in community with their fellow students and to deepen their bonds of friendship and trust through the practice of karma yoga and bhakti yoga. For the past 2 years we have shared this part of our journey together at the wonderful Green House, in South Wales, practising together in the lovely studio and in places of natural beauty. Nigel’s course embraces a broad range of spiritual philosophical and cultural practices and beliefs, and the joy of this was that we as student teachers, were given the opportunity to experience and digest this diversity. The choice of guest lecturers gave us such a variety of opinions and beliefs, we really were able to take on the beliefs which resonated best for us, giving us the opportunity to develop our own practice further, and providing us with plenty of food for thought. Personally I would not have been able to learn as much about Yoga culture and philosophy, had the course not have been this diverse and open-minded . I also feel the emphasis was very much on the skills we needed to become sensitive, safe well informed yoga teachers, as we were given ample opportunity to practice our teaching skills, and to receive feedback from the rest of the group. This was an invaluable experience, and I’m sure we will use all the feedback we received from the group and from Nigel to improve our teaching. I certainly completed the course feeling confident enough to deliver an interesting holistic yoga class. I now have an excellent foundation to build on, and feel that this is the beginning of an exciting journey. Subscribe to mailing list for more details. Thank you. Information you give us will be treated in the strictest of confidence. 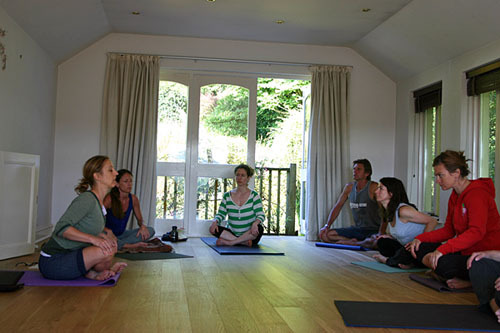 founder and director of the Brockwell Lido Yoga Centre, has been teaching yoga internationally for the past 15 years. Originally trained as a physical education teacher, his fascination by the mechanics of movement, led him to study with Derek and Radha Ireland, Naryani Rabinovich, Sri K. Pattabhi Jois and Shandor Remete amongst others. He has developed a unique style of mindful flowing yoga, enabling students to appreciate the internal flow of subtle energy, building strength around an central core. His teaching is informed by his practice of Tai Chi and bodywork and a keen interest in expression through movement. Chris has studied yoga for 30 years and has been teaching for 21 years. Starting with martial arts, Tai Chi and Chi Kung, he began yoga study with the Iyengar school, then studied with the Satyananda school with whom he studied extensively and qualified as a teacher, also gaining accreditation as a teacher from the British Wheel of Yoga. Informed by extensive studies with Sri. K Pattabhi Jois, John Scott, Shiva Rea, and also with Shandor Remete and Daniel Odier as well as his current committed engagement as a Vajrayana apprentice, these main influences move through Christopher’s Yoga teaching. Christopher has assisted on many courses with the Satyananda school, taught a BWY Diploma Course and worked as a specialist tutor with the British Wheel of Yoga as well as being an elder with the IYN. He has also studied, practised and taught Massage and Shiatsu for almost 20 years and studied Thai massage. A degree in Zoology and a Postgraduate science teaching degree informs his Anatomy and Physiology teaching to Yoga teachers. Having also completed training in Hypnotherapy and NLP, to certified trainer level, Chris also has extensive experience in a wide range of Yogic meditational practices. Currently studying for a Masters Degree in Philosophy, focusing on relationships of mind, body and cosmos from Eastern and Western perspectives. Chris teaches clear contemporary and grounded approaches to Yogic philosophy and understanding Yogic mind and the anatomy of Spirit. Christopher is also founder and director of both Yogasara, Radikal Freedom and Siddha Publishing in Bristol. Christopher brings an understanding and appreciation of the natural awesome potential of each of us as powerful, loving and talented beings to his teaching. teaches yoga rooted in the hatha and ashtanga traditions. She gained her teaching certificate with Richard Freeman in Colorado and has studied under Sharath Rangasamya and Sri K Patthabi Jois in Mysore, India. Gill began teaching in Brighton in 2004 and moved to Bristol in 2007. She teaches at Bristol Dance Centre, The Berkeley Centre and at Yogasara. She has also taught injury prevention and biomechanics on the yoga teacher training course in the Amrita School, London. Her teaching provides a foundation for the experience of awareness and insight whilst respecting that each individual has their own personal incentive for practising yoga. Gill is a physiotherapist specialising in musculoskeletal medicine since 1998. She is a qualified acupuncturist and is inspired by the science and philosophy of both East and West. Sama's passion imbibes the heart with a gentle distillation of timeless wisdom. The resonance of her words ignites the deepest visceral sensing and knowing intelligence. She carries a scholarly humility and radiates the brilliance of a true mentor. A gift of our time.